Want to have the quickest and easiest pet ever? Get your child a butterfly. 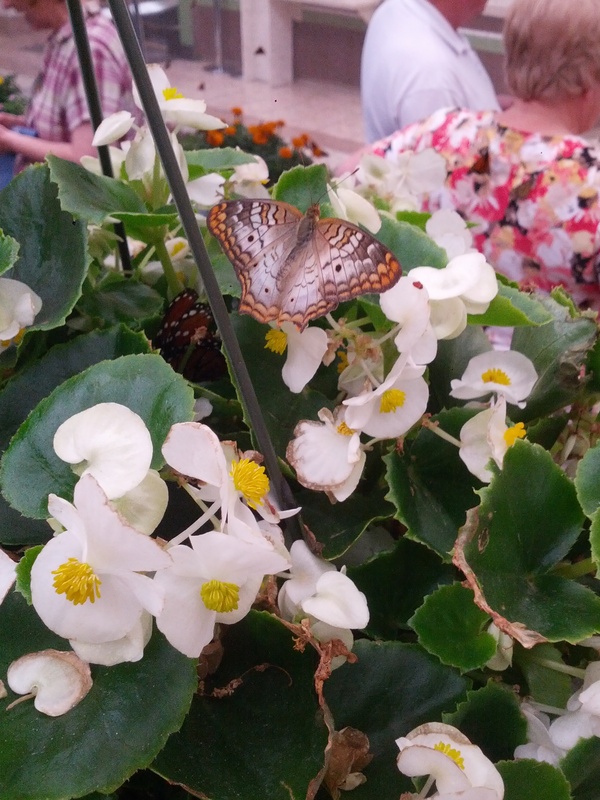 Emma and I have informally started a tradition of visiting the Kiwanis International Butterfly Festival at a mall here in Plano, Texas. I met a mom at the park last year who told me about it, and we had such a good time then, that I wanted to make sure we didn’t miss it this year. 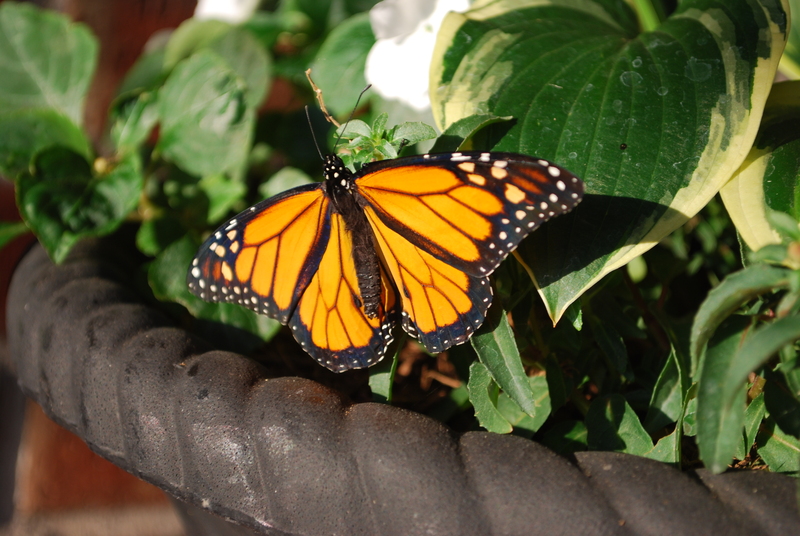 The best part, besides seeing all the gorgeous butterflies, was being able to take one of your own home. I’m sure someday Emma would love a dog, but you can’t beat a ‘pet’ that all you have to do is release it once it comes out of its cocoon. Talk about no muss no fuss! Butterflies=best.pet.ever! 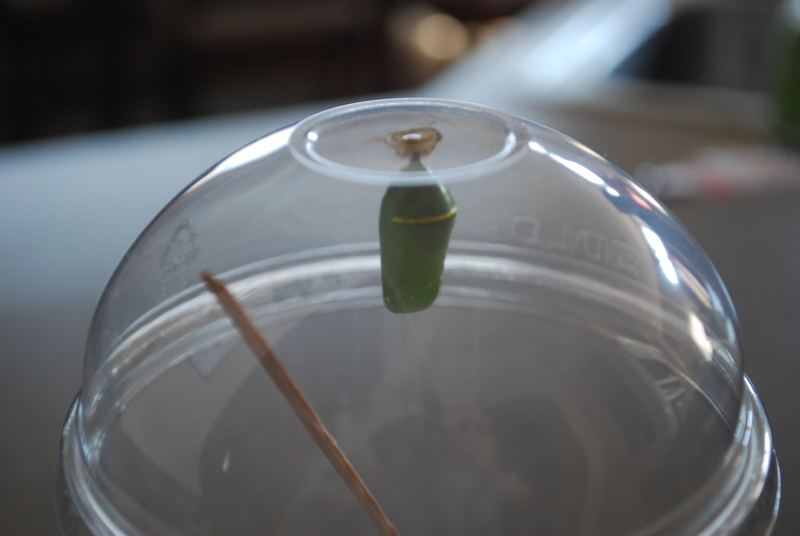 Basically you get a pupa and just keep an eye on it until it emerges. Once the butterfly emerges, you let it hang from the top for 12-24 hours to allow for its wings to harden and then release it. Easy peasy. You just let Mother Nature do its magic and viola, you have a butterfly! It was so cool to watch it emerge then be able to release it back into its natural habitat. The first year we brought one home, I asked Emma what she wanted to name it, so she asked Josh. His suggestion: Bob. Nice. When we brought this year’s home, and I asked her again, she wasn’t sure. 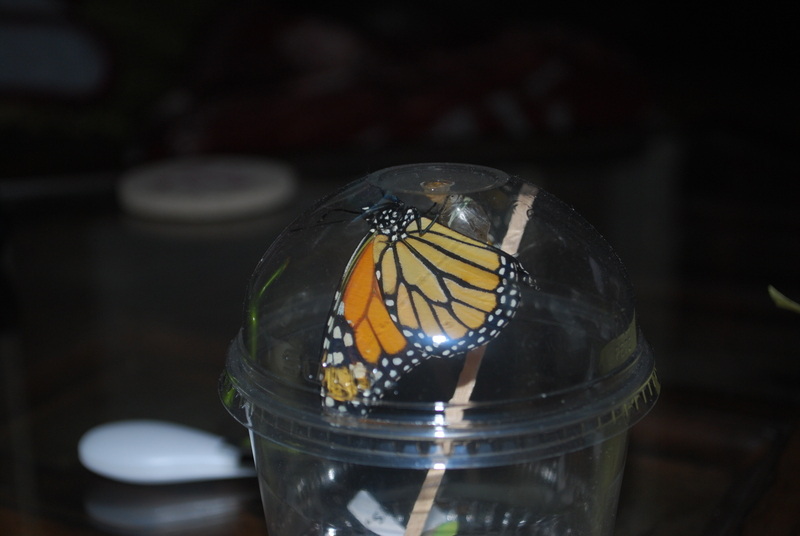 So, I thought it would be funny if we kept with tradition from The Simpsons and called our newest butterfly, Bob II. Ha! It was fun to watch Bob II especially since Emma was older and more concerned on his well-being. I’m thinking this will be a yearly event for us, as long as the Kiwanis put it on (and I remember to go). I talked to the guy after we went through the exhibit and he said the butterflies come all the way from Florida just for this event. 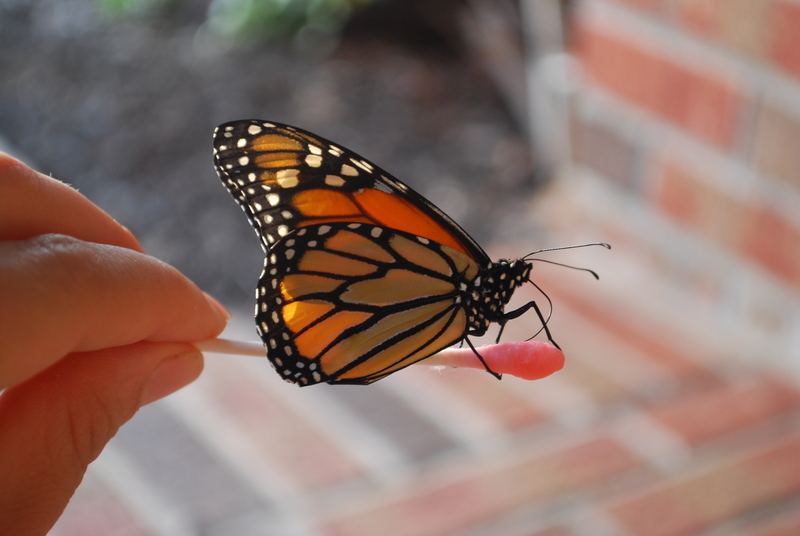 When we got inside all was well…until a Monarch landed on Emma’s tummy. I will admit I am a bit skittish when something lands on me, so I don’t blame Emma when for crying when it landed on her shirt. It was hard not to laugh at her-especially when she was telling random strangers about the ‘traumatic’ event. Poor baby, I gotta get her exposed to bugs more. Here’s Bob I from last year. When we went into the exhibit they gave us q-tips soaked in fruit punch Gatorade, so I made sure to have a bottle when he emerged and allow us more time to gawk at his beauty. 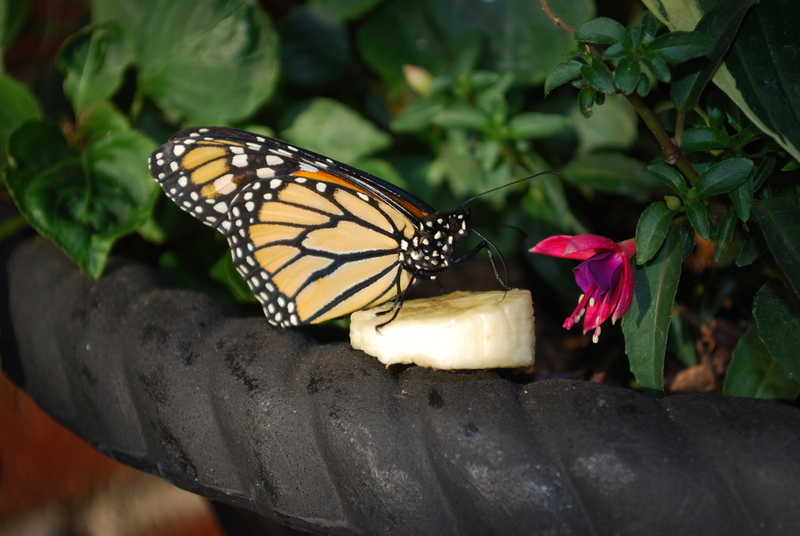 We were also told that they love bananas, so we enticed him with that as well. 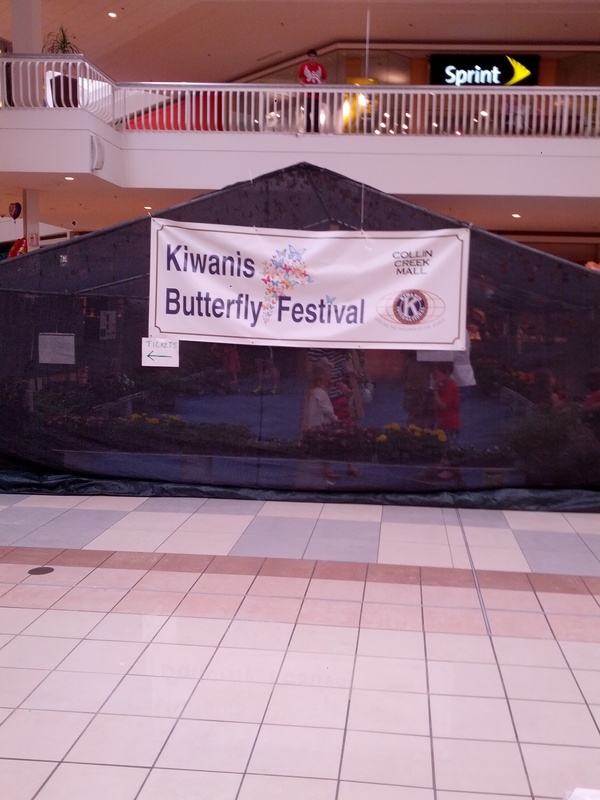 I think it’s a really neat thing that the Kiwanis club does and I love how they expose children of all ages to the beauty of butterflies. It’s a nice way to be able to see butterflies up close and personal instead of having to chase them all over the yard. 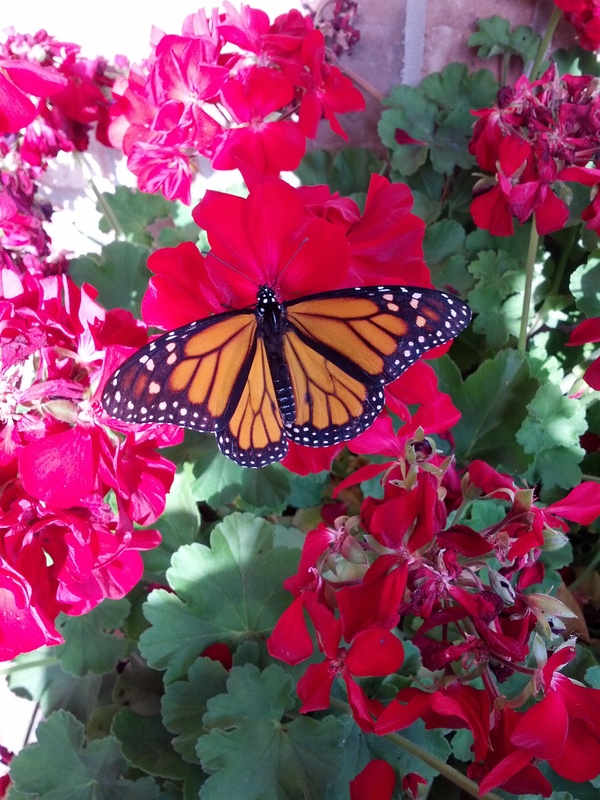 Honestly, this post was about showing pictures of butterflies and how beautiful they are…can you blame me? Even if it’s a small tradition, I still think it’s a fun one for Emma. 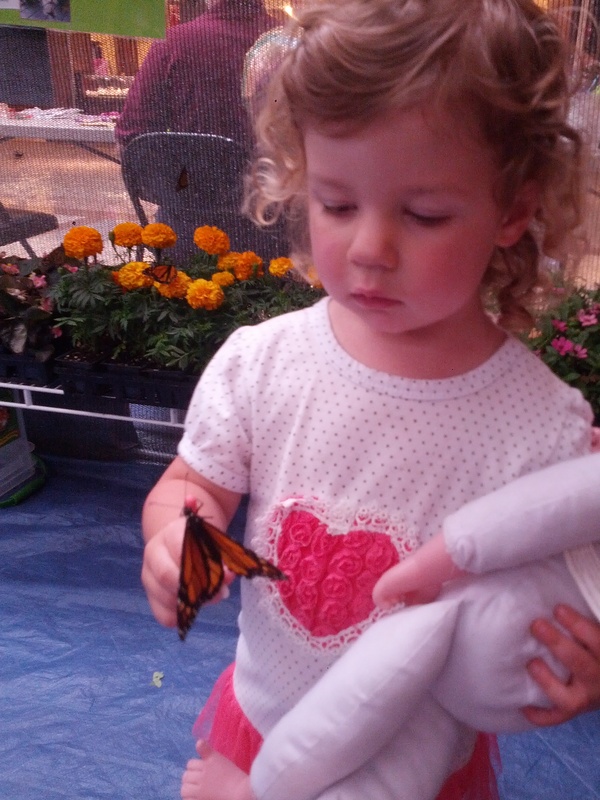 Maybe as she gets older she’ll ask when we can go to the butterfly festival and get another Bob. Who knows how many Bobs we’ll end up with at this point. Do you have any fun traditions with your kids? Do you have any non-traditional pets? I’m sure we’ll eventually get a dog, but I’m not quite ready for another ‘toddler’ in the house. PS-We are headed to pick blackberries tomorrow for our first time ever, so I’ll make sure to share the good, the bad, and the ugly yummy next week. Do you have any exciting plans this weekend? « We Bought A Cow And A Pig!